Toca House by Toca Boca is an iOS application that contains 19 distinct mini-games. Toca Boca has geared all of these games for children ages 2-6, and each game seeks to impart some real educational value. The app requires iOS 4.2, and it’s universal, so the app works on the iPad, iPod touch and the iPhone. 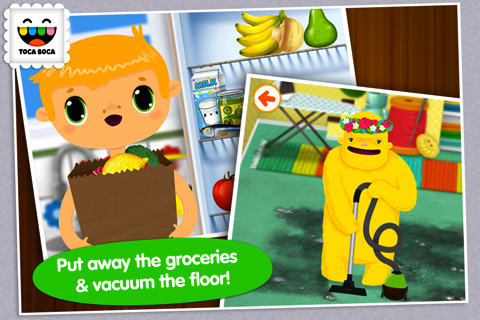 For the purposes of this review, we played Toca House on an iPhone 4S and iPad 2. 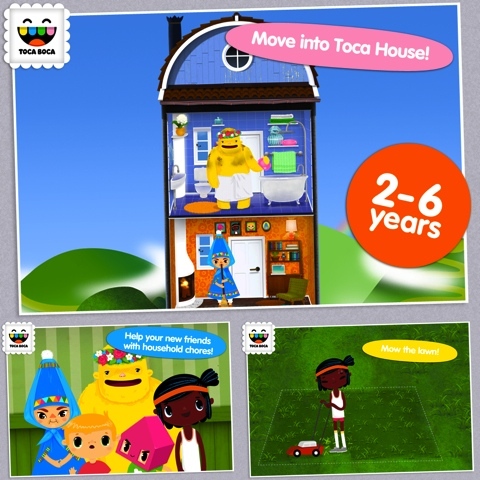 It’s important to note that Toca House is targeted toward the younger audience only. There’s nothing here for adult gamers, and most children older than six or so will grow bored with it much too fast. For parents with young children, however, it’s an excellent investment at only a $1.99. With 19 distinct options, it will occupy even the shortest of attention spans, and as mentioned, this is an app with real educational value. Any parent with a child at age 2 or beyond knows that one of the great challenges for young children is cleanliness and other domestic responsibilities. A young child simply doesn’t understand why they have to pick up their Duplo blocks after they finish playing. As parents, it’s our responsibility to reinforce these behaviors continuously in a positive way. Of course, this a great challenge, even for the most patient among us. So this is where the Toca House application comes into play: Each Toca House game centers on domestic chores. Some of these duties are common to young children, such as cleaning their room or taking a bath. Other duties are tasks that they see their parents performing, such as ironing, hanging pictures and even mowing the lawn. Each time the child opens Toca House, it presents a new “workday,” which consists of ten randomly selected and ordered chores. What’s neat is that Toca House doesn’t present the mini-games as ten distinct experiences. Instead, they all take place within a single virtual house, and using swipe gestures, the child makes their way through the house to the various chores. What makes Toca House work so well is the aesthetic, music and sound effects, which are all exciting and very professional. Toca House even has five distinct avatars, so that kids can pick an avatar that looks like them or that they identify with. If you’ve seen Yo Gabba Gabba, then you have an idea of the sense of energy and atmosphere that this program delivers. If there is any negative associated with Toca House, it’s that it only works in landscape mode. It also doesn’t respond to the accelerometer, so it can display upside down. Sure, it’s actually the device that’s upside down, but this is program meant to be played by 2 years old. Still, the bottom line of this review is that it’s an excellent buy at $1.99. Toca House works well on both the iPhone and iPod touch, but most young kids will probably have an easier experience playing this app on an iPad. AppSafari review of Toca House was written by Darius Reimm on March 13th, 2012 and categorized under App Store, Education, Games, iPad apps, Universal. Page viewed 4540 times, 1 so far today. Need help on using these apps? Please read the Help Page.